The final item that finishes off the blankets ... labels. Labels on fleece blankets are tricky. You want to have all the pertinent information but not so big as to be a big blob. I do have special labels that I put on my quilts, but they weren't appropriate for fleece blankets. I wanted something unobtrusive, yet would identify me as the giver. I then thought to use a small font and embroider the label information on a wide ribbon. This worked out rather nicely as the example shows. The font I used is called Small Line and I purchased it from Patty B's Sew-n 2 U. Patty has a really lovely collection of small and LEGIBLE alphabets, very reasonably priced. Check out her other collections, too, as they are very nice. From a different design, I split a small daisy and then merged the daisy onto either end of the verbage to complete the label. Now, how did I actually stitch the label? Because the label is so long and skinny, hooping an entire piece of stablizer seemed to be a real waste. All I really needed was a water soluable stablizer in the area the ribbon was going to be stitched. 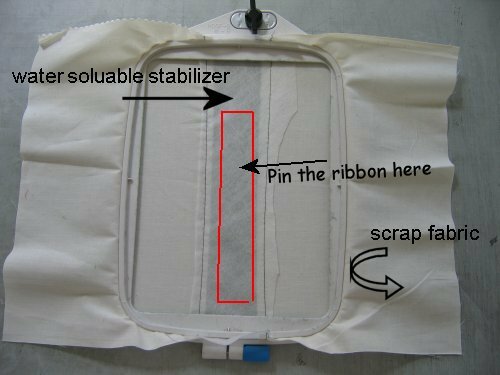 Therefore, I cut a long, skinny strip of water soluable stablizer and sewed it between two pieces of scrap fabric, making sure that the scrap fabric pieces were large enough to be completely hooped. I then pinned the ribbon to the stablizer (making sure that the pins would not get in the way of the needle), centered the whole thing in the hoop and stitched away. When finished, I unpinned the ribbon, cut away the excess stablizer and rinsed the remainder. The label turned out very soft, pliable, unique but unobtrusive. It was then hand-stitched to the back of the blanket. Close down this window to return to the Embroidery Home Page.